In the last few days I have suddenly been receiving emails and posts on my Facebook asking about muslims, immigration and the English Defence League. Why are people in my peaceful home town of Weymouth suddenly getting all worked up about these issues? Weymouth is not a town with very much ethnic diversity. The latest figures show the population to be 96.3% White. The few ethnic minorities in the area are well integrated and mostly long settled. For example there are around just 15 Muslim families in the town and almost all work in the restaurant industry creating employment and as an important part of our local tourist economy. As the local MP the most common concern from them was about recruiting local people willing to do the hard work demanded in their kitchens. But I also met others running a local playgroup, at the local football or at parents evenings at the local school. These people are hard working, peaceful, tolerant and at one with our community. Within this relative calm there has also been worry on the doorstep about immigration. This appeared fuelled more by the media than by local experience, although there has been a little resentment by a handful towards the Polish community. This recent concern contrasts with the big local issue of the 2005 election when there were big protests at the deportation of the Kachepa family back to Malawi. This balanced local view has been disturbed by a BBC documentary “My Brother the Islamist“. This was the story of a tree surgeon from Dorset who discovered that his brother had converted to Islam and had been radicalised. The filmmaker appeared to trick his way into the tiny room that functions for a mosque in Weymouth, and some then had the impression that young people were being radicalised here in the town. A recent article in the local paper makes clear that this is not the case, but too late now as the rumour mill is in overdrive. This has now been compounded by the English Defence League organising a demonstration in Weymouth over the Royal Wedding weekend. This is a wholly unwelcome distraction from what should be one of the busiest weekends for the local economy thanks in part to the annual Weymouth Kite Festival. Not only do we now have the possibility of a great weekend being tarnished but local businesses are worried about the trouble that has been associated with EDL events elsewhere. Like Jon Cruddas MP, I think the EDL are a bigger threat to British traditions of tolerance than the BNP. At a time of high unemployment, housing shortage and cuts to the welfare state we are particularly vulnerable to the rise of far right fascism. The possibility of that particular poison reaching somewhere as peaceful as Weymouth makes me anxious. That is why I will join others in publicly expressing our opposition to the English Defence League in Weymouth. Now here is a wonderful opportunity for you to get to know constituents. Go and see them. Ask them why they feel the way they do. What has upset them and frightened them this way and let them be open and honest with you. Rather than give the impression if they express their feelings they will be regarded as bigots and low life idiots. And then, once you know the true reason for their fear, ask yourself if the fears are based in any sense of reality or whether what they have said is all imagined. That way you won’t have to guess or assume what it is they have in mind. Instead, you may be in a position to represent the people who vote in your area. Or, who have voted for you in the past. Also, take into account what people have seen with their own eyes and have heard or witnessed from the mouths of their friends. You cannot hide from the reality of their experience, even though you may find it uncomfortable to address. Remember, this fear and disorientation was brought about as a direct result of government policies. What is happening cannot be blamed on those who had nothing to do with the poor judgement of our leaders. What was the real reason governments decided on policies they knew would distress the public, yet ignored their wishes and concerns they had for decades, real or imagined. In other words, take responsibility for the actions of Parlieamnt. Or, the lack of them. 0801 Sunday 17 April 2011.JSDM. 3) Their over-killing and extincting of renewable Earth resources, and over-destruction of non-renewable non-living Earth-resources. 4) Their repression and suppression of Human Effectivities, throughout both World-Workplaces and World-Lifeplaces, as a result of their above three Negativisations of Present Human ability and immediate human potential for individual and collective improvement and sufficiency in all things. We can only hope that a sufficient few remain right-minded, willing, and able enough to catalyse a Peaceful-Revolution, world-wide. It is up to the Parliamentarians to urgently begin necessary Reforms for making both Civilisation and Peoples worldwide, sustain-worthy. The noble lord may not have noticed that there are some towns in the UK which just do not have ethnic minority Asian or Afro Caribbean populations. There may be a reason for this, entirely other than the so called EDL, which sounds like a splinter group of BNP. They are hounded out, by the education authority, by the housing authority, and so on and so forth…..
are inevitable. It is best just to ignore them for what their opinions are worth. Weymouth, I may say, which I visit from here in Ceredigion, a few times a year, enjoyed the patronage of a Muslim convention some years ago, during their holy season, so I don’t know whom the local hoteliers will be supporting in the proposed ugly scenes planned! Asians and Afro-Caribbean minorities, mainly because they do not want to go there! It is not the Ganges for s start, and the sun is better at home for the Afros. Ethnic Brits may have two homes, and one in an Olde World holiday resort in these islands, but the Afros have their Caribbean roots to go to, without so much as a peek at or Pwlhelli or Torquay. England is utterly decadent but London is a vibrant -metropolis, going on mega- , which most Africans from that continent will give their right arm for, and some death on the way. The whole world knows that England is thus, and London is thus too, and never the twain shall meet. From one end of the Bournemouth and Poole promenades to the other, on a hot day, how many Asians or Afros will you see?!! 30 perhaps out of thousands!!! We have in this country a great lack of housing, too many unemployed and cuts that are hurting the poorest. Our young sons & daughters unable to afford homes and secure a future. It is not yet comparable to the 1930’s depression which saw the rise of the far right in Germany but it is working it’s way toward it. The terrorist threat doesn’t help but is blown out of proportion in comparison to events of the 70’s and the IRA. Throughout history minorities have been blamed for societal ills, gypsies and Jews were witches to be burnt at the stake. One only need look at the history of witchcraft to note the symbolism associated with it was Hebrew. Integration of immigrants takes time, a lot of time and some still feel alienated which is why we have such associations as the Black Police Association which sets itself apart because it believes the system is discriminatory. No matter what I know or how I feel at some point in the future seperation of parties, perhaps religions, will cause factions to become warring factions within this country. The differentiation the system demands in counting colours, religions etc., will only succeed in helping bring forward those events. It is easy to be politically correct and against the far right but were you also so loud when others were burning poppys or protesting loudly during silence for our fallen servicemen ? If we are to address this we have to be seen to be fair. It is not all one sided and amongst the propanganda there maybe elements of truth. Whilst you are publicly expressing your opposition to the English Defence League in Weymouth, you may like to express the opinion the reverse is not welcome either. The answer to these problems lies in the ballot box. People become radicalised when they feel they have no control through the ballot box over EU law and taxpayer bailouts of the bankers loading the economy with yet more debt. That breeds alienation which it is easy for groups like the EDL to harness. Perversely the ‘nanny knows best’ approach will backfire if people are dictated to, rather than being persuaded of the benefits of a ‘single market in capital and labour’. We can criticise these people all we like, but the fact that politicians have stopped listening to their concerns is at the root of the problem here, and I don’t see any evidence at EU level that this is likely to change. You might like to know about the trouble groups like the EDL can cause to towns and communities where they purport to speak for the majority of people. In Grays, Essex, yesterday a group of 50 EDL supporters, worryingly in masks and balaclavas, stopped ordinary people getting through the train station and walking the common roads about their private business. 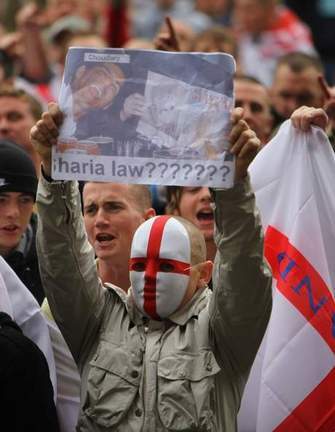 A mixture of football hooligan techniques and thinly-veiled organisation (watch the high-visibility jacket EDL ‘steward’) shows an intent to cause trouble. Despite police intervention many of the people caught in the frightening episode were ordinary commuters. Weymouth and other areas need to be vigilant, this could easily be your community. The intimidation and terrorising of ordinary people who don’t look like them is a disease quietly infecting our communities. requirement at UK ports from/to the EU. I thought the first principles of the EU were the “Free movement of people and trade”, but there is a campaign at the moment against Tobacco smugglers of all things because the government does not want to lose its huge ciggies and alcohol tax revenues. Is that free movement after 25 years or more of membership? You could, of course, always call for a democratic answer to this dilemma, by taking the Swiss example and staging a referendum. If the EDL and the BNP claim they speak for the majority, then put it to the test. Ask the public what they want to happen with regard to immigration. How they want it dealt with. That way, we will all know how the majority feel on the subject, won’t we? And if you feel uncomfortable about giving such a free and open test of government policies, ask why you feel so uncomfortable? Could it be you already know what the public feel and want and don’t want to take them into account, once again. The EDL and BNP haven’t come out of nowhere, they are speaking for a million frightened people. As the voting records show. What you need to pursue is why government took such extreme steps to promote immigration to such an extent British people feel they have to become radical in order to change the momentum. As another wrote above, the balance of immigration is a complex and sensitive issue. Why did governments want an influx of cultures and lifestyles they knew would overwhelm the nation this way? As you must be aware, these objectives were brought in to lower the standard of living of the nation by reducing their income. Well, you have what you wanted. People feel they are working for slave wages. And if you believe that turning the London riots into an issue of ‘celebration,’ rather than what it really was, then only you in Parliament are to blame for the outcome of that foolish decision. Labour deliberately wanted to change the racial make up of the country. They wanted multiculturalism so badly they were willing to face the anger and frustration they now see in front of them. And this movement of the people is taking place throughout Europe, not just in the UK. So stop trying to pretend it is only the British people who are worried that their country is changing beyond all recognition. Into a society they don’t want or revere. Pretending that the British are alone in their fear of mass immigration is an outright lie. And do you really believe in this world of Internet access and mass travel the people can be blindfolded by this duplicity any longer? Allow the electorate a say? You’ve got to be joking. Even AV isn’t about allowing the electorate a say, its just about which MPs get to dictate. As for the Lords, they aren’t democratic at all so they won’t get it at all. system/method for elections to parliament. So long as nothing gets in the way of claiming expenses My approach was that if I did not want the responsibility I would not take the money. Had I taken the money, for committee attendance and so forth, I would then have been given some Special adviser responsiblity. £1.3m worse off now, counting from 1997, I am still not sure that I regret making the decisions that I did….. not to take the money. Still I have a lovely young wife! The People who, ironically in turn although possibly being sufficiently willing to cooperatively-shoulder the Big Burdens of Right Reform and Peaceful-Revolution, have been left hopelessly unable and unskilled at doing so – demonstrations and ballot boxes can not be trusted either. For those few who are willing and able to cooperatively organise and steer the necessary Reforms and medium-to-long-term Peaceful Revolution,it must be a matter of choosing the best of the existing ‘Hows’ but also of creating.constructing a new ‘How’ the while. Through the voluntary non-profit websites I share with a few other low-income people I today put forward the immediate propositional-statement that the Big Threat is the longstanding insidious corruption and resulting Collective-Insanity of all Bodies of Humans, all around the World. I shall attempt to post it just below this submission, as a reply, for simplicity’s sake. ‘How’ can we the various races and national-communities on this Earth somewhat urgently and vitally make ourselves longest-possible-term Sustain-worthy ? will be the eventual Solution to that propositionally-stated Problem, I submit. People in Weymouth are getting worked up about it, because The Echo are stirring things up, getting people worried with their sensationalist reporting. Still they must be happy at the increased circulation, it’s a shame it’s at the expense of something like this nonsense. @Mark G: People as a group do not get worked up over articles in newspapers. They get worked up by what they see and fear is happening to them. To pretend otherwise is a scam and a denial of the right to a voice. Newspapers expose what they pick up as they go about their business. And usually they are way behind public feeling not the front runner. What could, The Echo, possibly say that would stir the British to complain? They won’t move out of their chairs for anything other than what’s going on at their local. Unless, they are suddenly confronted with an issue they fear. To be of the opinion that the British don’t know their own minds is an insult to them and a denial of truth. If you ask people, you will find many in Dorset have fled from their home counties as a result of the mass take over of Towns and cities throughout the UK by cultures they don’t understand, want to absorb, or, find unacceptable as a way of life. And please tell me why should they? Do you know? London, Birmingham and many others cities in the UK, are held up throughout Europe as the image they ‘don’t’ want to emulate in their own cities. And this discussion has been denied and concealed in this country relentlessly by those who instigated the situation in the first place, and who continue to push it as the way forward. Regardless of what they see taking place to the detriment of the British tax payer. Where do you want the British to move next? Into the sea? Because that is the only option left. And I can just hear those heroes of the Left agreeing with that sentiment. That would solve the entire problem of disassociation and the right to remain free. For, isn’t this country still ‘ludicrously’ white? According to the BBC and the astonishingly ignorant representatives of their ‘so called’ left wing policies. One of the reasons we need to ask for a change in the voting system is because the country is run by people who are totally out of touch with the majority of the nation. And they come up with AV. Another dodge to fool the people into believing they have Democracy. What you fear is The Echo opening up discussion. And now, why is that? What are you gaining by silence? Covert policies or cover up of actions and intentions was how Hitler took over Germany. He too wanted and kept a cloak of silence about what was really his party motive. Because he knew he would not have been acceptable had he told the real story. And that is what you are suggesting we should collude in here and now. The suffocation of Freedom of Speech. @Lord Knight: Yet! But don’t hold your breath. It won’t be long before we have the same heavy pressure they have in the rest if the countries where Islam wants to make a difference. And guess what, government knew of these world trends long before Labour began their open door policy for immigrants here. Now, why do you feel they wanted to import this enormous change of culture and at such a rate while denying the right to discuss the trend? As the population shrinks so does the culture. I’ve got a sixer, that was hardened off after the last concer season. for the Island, and has its own independent councillor for the purpose. on the promenade at Bournemouth/Poole yesterday and the figures are roughly as I suggest. colonizes the beach at Sandbanks on a fine sunday(no restaurant business that day perhaps)in vast numbers. For once and for all time,will everyone please understand that Islam is a religion not a race. the E.D.L. the B.N.P. and likeminded people cant get that right but if those who stand up against their stupidity cant correct such a fundamental error the hate and ignorance continues to spread.I am living in the Weymouth area, English and Muslim.I don’t run a restaurant or organise conferences to fill the hotels.Im just a housewife,quietly bringing up her children by the sea, whose religion happens to be Islam.Thats my business and no-one elses.What i do or dont wear on my head is also just my business. How can anyone possibly get so worked up by such trivia as a piece of cloth on my head? Children die at the hands of their parents, women die at the hands of the men in their lives, genuinely terrible things happen in all our comunities, maybe next door to you.And all some people want to be angry about is a religion that they have absolutely no understanding of. Ah, but that is not the whole story is it? And I don’t think anyone on this thread is crossing Islam with any race of people. We all know that Islam, just as Christianity or Buddhism, or any other religion that is multi racial, is just that, multi racial. However, the people who follow Islam are subject to the kind of control this British society does not consider in their best interests. The belief in many of the edicts of the Koran are directly opposed to those we have followed in Europe for centuries. And many of our ancestors died fighting for the rights we all have the good fortune to live with in this country. The movement of so many immigrant Muslims is changing our society into one many of us feel is oppressive. Thank God we have the ‘freedom’ to openly discuss our concerns at what is taking place in out midst, otherwise this blog would not be here, would it?. That privilege would be removed if we are subjected to the overbearing requirements of Islam and Sharia. Islam is not simply religion it is also the law. Sharia for example. And the idea of Sharia is not an acceptable form of living for the western mentality. Especially Western women. We, in the UK and throughout Europe, are not willing to go along with the idea that women are subjugated by men. And that cloth on your head you raised, becomes a shroud in a very short period of time, which is an outward manifestation of female oppression. It is very offensive to many western women as it frightens them because they feel, one day, if our Christian ethos is lost, they too will be closed off from life itself by being forced to wear it. And as many other countries were once free from the Islamic requirements of this kind but because of the marching pressure of the religious leaders have now had to submit to its teaching, then it is not out in left field to apply that to what is happening to us here and now. Is it? Im too very worried about tomoro. Many people that my friends know, that are not from orgorney from the town, e.g people from Packistan and Shrilanka. Im too very worried as Im a white English women that converted to Islam, that wears hijab. Im staying away from the town tomoro. I hope to go into town on Sunday to see the kite and I hope not to get any hassle from anyone from the EDL who has stayed in the town for the weekend.